Hotel Taj Mahal New Delhi, Taj Mahal Hotel in New Delhi, Hotels in New Delhi, New Delhi Hotels, Hotel Booking for Taj Mahal New Delhi, Taj Mahal in New Delhi and India Hotel and Resort offers online booking requests for the hotel packages to the Taj Mahal hotel and provides brief information about the hotel. 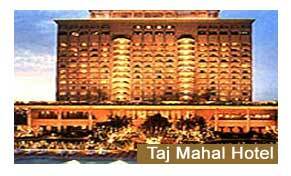 Taj Mahal Hotel, New Delhi is a big name in the hospitality industry. Its name is reckoned among the top five star hotels in New Delhi. It is situated in the most advantageous location of the Delhi. Ensconced in the famous residential area of the city, Taj Mahal in New Delhi is an epitome of the opulent Mughal architectural patterns. It presents a perfect blend of old and new through its architectural brilliance and contemporary amenities that entices both business and pleasure guests to secure accommodations here. Taj Mahal Hotel, New Delhi features beautifully and aesthetically furnished 296 Rooms. All the rooms are very spacious and cozy. They indeed ensure luxury stay in Delhi. These rooms are divided into several categories that include Superior Rooms, Deluxe Business Rooms, Taj Club, Executive Suites, Luxury Suites and The Grand Presidential Suite. All these guestrooms differ from each other on the virtue of d�cor but they are similar as per some of the very basic modern amenities are concerned. Some of the basic modern amenities that are found common to all include color TV, STD/ ISD telephone, en suite baths, running hot & old water, air conditioners, mini bar, iron & ironing board, hair dryer and plenty of others. Taj Mahal Hotel New Delhi has devised a commendable array of facilities and services that cater to business and recreation needs of the guests. It presents 6 refined meeting rooms that have a capacity of accommodating 20 to 400 people at a time in auditorium style and 20 to 1000 delegates at a time in reception style. Taj Mahal Hotel in New Delhi also has a well configured business center that offers facilities like hi-tech broadband wireless internet connectivity, PC workstations, multimedia computers, laptops, portable printers and cell phones, color copying and secretarial facilities. This apart, New Delhi Hotel Taj Mahal boasts of terrace garden and poolside lawns too where formal and social gatherings can be arranged. Further to help both business and pleasure guests unwind Taj Mahal Hotel in New Delhi bestows a fine range of recreation facilities. These facilities comprise of Health Club and Fitness Centre with steam baths, Jacuzzi, and sauna, Gift Shop, Golf, Swimming pool, City tour, Shopping tour and Tejas Spa. Extending facilities and services a bit ahead, Taj Mahal Hotel in New Delhi also boasts of a variety of additional facilities that consist of Babysitting, Beauty Salon, Car hire service, Concierge service, Currency exchange, Doctor-on-call, Express laundry / Dry cleaning, Florist, Travel services, 24 hour Room Service and 24 hour cyber butler on call. Indiahotelandresort.com offers online details on Taj Mahal Hotel, New Delhi. For more inputs or to make a booking, please fill up the form given below.